Blue lilies with 6 prominent yellow stamens in the middle. Tufted plant forming dense clumps and tussocks. 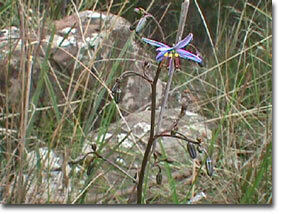 Widespread and common especially in wetter areas on rocky hillsides, sea level to mountain foothills. Plants spread by stout rhizomes and may be invasive.Division of rhizomes during the autumn and early winter is the quickest method of propagation. Divided plants can either be planted directly into their final growing position or potted up and grown on for a year. Remove half of the leaf area to reduce transpiration and water loss and aid establishment. Clean fermented pulp from seeds by soaking in a sugary solution and sow immediately. Smoke treatment has increased results for some species. Soaking seed in soapy water (velvet) or a light scarification with sandpaper have also been recommended. Temp. may be critical in germination i.e. not above 18oC - Andrew Stevenson. Used in traditional Palawa basket weaving. (Ref. Tasmanian Aboriginal Baskets). Also used in modern basket weaving. Suitable below powerlines. Relatively easy by division. Division of rhizomes during the autumn and early winter is the quickest method of propagation. Divided plants can either be planted directly into their final growing position or potted up and grown on for a year. Remove half of the leaf area to reduce transpiration and water loss and aid establishment.